We can debate whether or not it’s still “cooking” if you don’t heat anything. Regardless, I’m going to say when ingredients come together like this, it’s my favourite kind of cooking. Fresh basil and tomatoes from our local garden market, incredible white anchovies and parmesan from our Italian store and top-notch balsamic from the olive oil tasting bar. Add some salt in the right way along with a pinch of pepper and you have a tomato salad that rivals some of the best dishes you’ve ever eaten. Be sure to use white anchovies for this salad. They are entirely different from those super salty, fishy things in the can you’re likely familiar with. Place the quartered tomatoes in a colander and sprinkle with salt. Let drain for fifteen minutes, tossing occasionally. 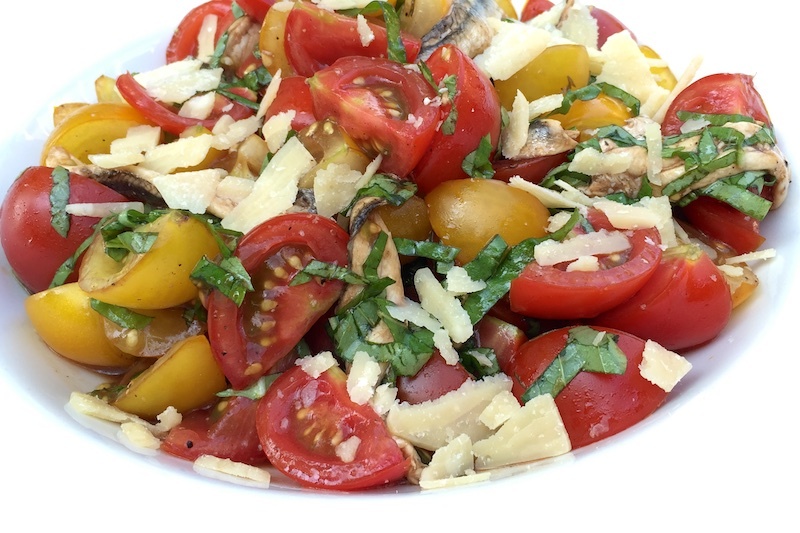 In a suitable bowl, toss the tomatoes with the basil, vinegar, pepper and anchovy filets. Plate topped with the parmesan flakes.